Sign up for Broadjam today to follow Zerohour, and be notified when they upload new stuff or update their news! Zerohour formed in the spring of 2000, when Sean and Austin were hanging out at Austin's house and started jamming on drums and guitar. Sean's sister, Sarah, joined the next week, originally playing keyboards before making the switch to bass. The thing that sets them apart from other bands is the age of the members. Sean is 16, Austin is 15, and Sarah is 13. But, they always amaze audiences with their talent, confidence, maturity, and stage presence. The band is influenced by artists such as Aerosmith and Green Day, but have worked hard to create a "Zerohour sound". 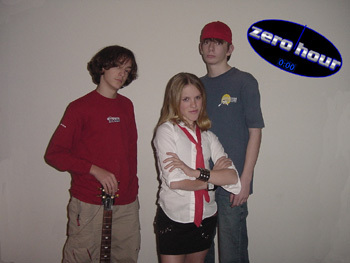 In the summer of 2002, Zerohour was one of 16 bands selected from hundreds of applicants to play the "Almost Famous Band Series" at a large outdoor venue in Richmond, Virginia. In the beginning of 2003, the band was featured in a segment on PBS TV.